An inspiring tale of a family following a passion. Stephen and Jeany Cronk left a comfortable life in London to pursue their dream of making incredible wine in the South of France. Their wine cellar opened in July 2014 on Cours Gambetta, restoring a drab-and-dreary building “La Falaise” into its rightful glory. There are no more traces of its previous life as a car garage, instead they uncovered wine cuves and tunnels from hundreds of years ago when it used to be a winery run by the Penitent Blancs. Wine tasting is available in the gorgeous wine cellar from Tuesday to Saturday during the busy summer period (opening hours are normally from 10h00 until 20h00). Off season, wine tasting is normally available on Tuesdays (market day) and on demand. If you’d like to organise a private wine tasting for groups of 6 or more, with Stephen or one of his crew, contact them directly via their website or social media accounts. 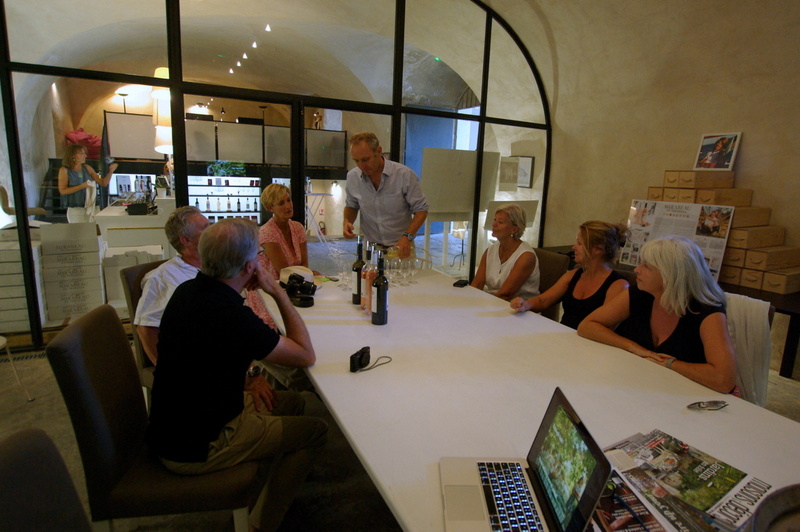 In July 2015 Jeany opened Mirabeau Maison, her beautiful boutique, adjacent to the wine cellar so you can buy gifts and taste their delicious wine!